A Modern Vintage Cowboy ... Is that a thing?! 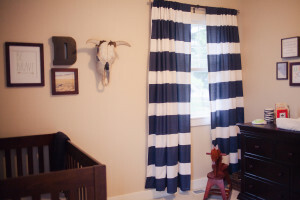 Here we are, closing in on Deacon's first birthday (I might have just blinked back serious tears typing that) and I am finally getting around to sharing the little mister's nursery ... is it still a nursery when the sleeping babe is one?! . Before I give you the tour, I have a bit of a confession. The reason I am just now getting around to sharing this room is because, well ... we just finished it :) I always have the best of intentions to finish something that I have started within an acceptable time frame, however somewhere between starting and finishing, life gets in the way, and I lose all motivation ... ha! So now that you know one of my deepest, darkest secrets ... without further adieu, I give you Master Deacon's room, and a little (ok, long) back story to accompany the pictures! First off, we found out that we were having a BOY right before Christmas 2013 (lol ... that seems like 12 lifetimes ago) and while shopping, I found a JellyCat stuffed animal that was the most adorable white and brown pinto horse. PSA: if you ever need to find a 'lovey' for a baby, get a JellyCat! They are THE BEST ... so soft and cuddly, and are the most darling animal characters, many of which have matching children's books. I knew the instant that I found the horse that he was the perfect lovey for our baby boy; and he also would serve as the inspiration for the nursery! I tried to play it cool when I handed Luke the gift from under the tree with a tag that read 'To: Baby Boy Bennett Love: Santa' ... but as soon as he opened it, all my ideas for a 'modern vintage cowboy' room came pouring out. My poor husband, he's such a good sport ... he just smiled and nodded and when I finally stopped talking, quietly said 'I think that's perfect!'. Chances are he didn't really know if 'modern vintage cowboy' was a thing, or if a 12 inch plush toy could be the inspiration for an entire room ... but he kindly went with it. Here he is! Doesn't he just scream modern vintage cowboy?! Haha, in my now non-pregnant brain, I can catch a glimmer of how crazy my original ideas may have sounded ... but just a very slight glimmer ;) Farah has named him 'Deacon' (she's so original) but I think we'll give the cowboy a some more time before the horse gets an official name (in hopes that Deacon learns to say something besides 'dadadadadadadada'). As far as decorating the room, I didn't have to go far to find some key design pieces ... my parent’s house was a treasure trove of 'vintage cowboy'! My mom's family has been in the ranching business since the early 1900s when her maternal grandparents settled in northern Nevada as sheep ranchers. As a child I spent my summers at the ranch, and often found 'ranch artifacts' as we called them (an old rusted can of sardines with the original rollback tin top still intact is not junk or trash people ... it's a 'ranch artifact'). Many of the more unique artifacts that came home with us from the Nevada desert eventually found a place as art in our home, serving as a daily reminder of our ranching heritage. I look back on my childhood summers with such fondness, the ranch being such a huge part of my story - I literally CANNOT wait to take our children there, to give them similar memories of their own to cherish for a lifetime. Bringing a little bit of the ranch into Deacon's room was so much fun, and more than a little nostalgic! The skull (lol, it makes me laugh talking about a skull in a nursery, but stylistically, it fits ... right?!) was a must-have, there's not much back story to it, other than my dad found it while walking the range and brought it home ... I kind of love it! The wreath came from the fence of a temporary coral; when cowboys would set up short-term fencing to complete cowboy duties like branding cattle, they would often string barbed wire and then leave the remaining coil hanging on a fencepost. After forty or fifty years exposed to the harsh elements of high desert weather, these rusted coils become the neatest looking wreaths. My mom found this one (and kindly let Deacon borrow it for 'awhile'). As for the small picture of the open range ... if you look closely, you'll see a wild mustang running through the brush. My mom took this picture with her camera phone (pre iPhone, haha) several years ago - so I edited the image to look a bit more like a painting than a photograph. I hope you enjoyed this little glimpse into one of my favorite rooms in our home!